The Weekend? I Can’t Remember What Day It Is! Got some cleaning done around the house on Friday. Being so sluggish all week, I didn’t accomplish what I usually would in the first day or so. But now things are looking better. That’s a good thing because we have friends coming to visit us on Saturday from El Paso. Ralph thinks they’ll be staying over, but I don’t think they will. They’re an older couple, set in their ways. Hmmm…that sounds a little bit familiar! 😉 We’re looking forward to the visit. I’m also excited because Saturday in Silver City means the farmer’s market! They always have unique and interesting things there. When we were here last year because of various reasons, I never got to go. I’m excited I’ll get to this time. We’ll see what treasures we find. We went into town to get some copies made of Ralph’s artwork. The store where we get that done also has a bead store in it. The young man who runs it also does jewelry repair. I had two bracelets which needed to be repaired and he was able to fix them for me. With all my bracelets on, I’m jingling like a Gypsy! 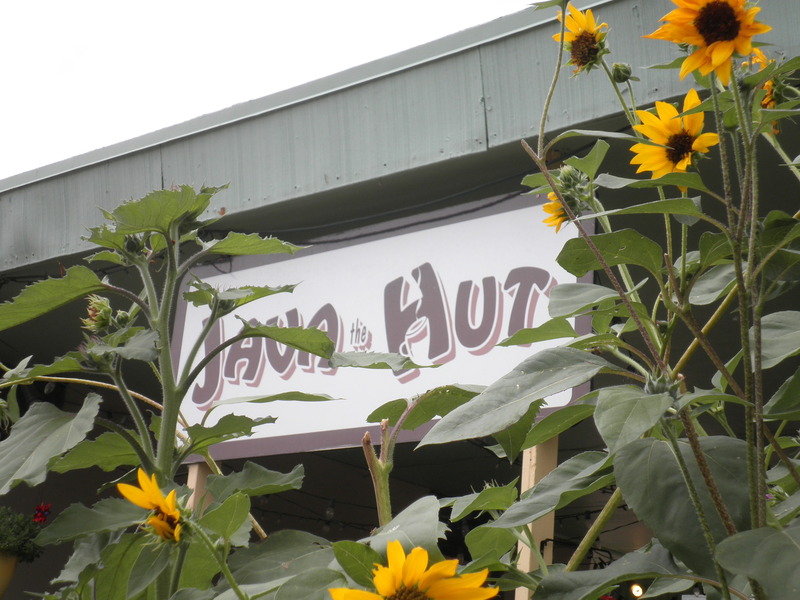 While we were in town, we couldn’t resist another visit to Java The Hut. The entire area around Java and The Hub area is filled with beautiful flowers. I’ll take some more photos of them over the next few days. We decided to have lunch there again…and of course Coffee!! 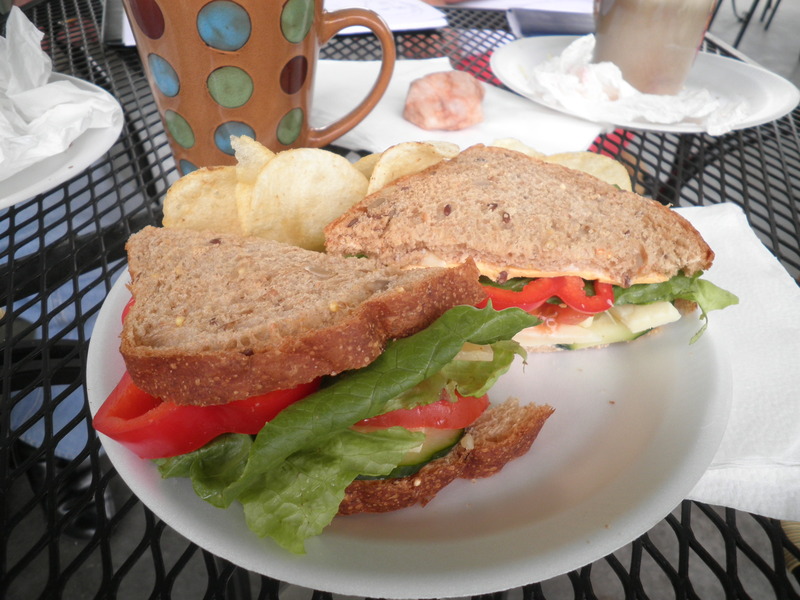 Marcia, the owner put together a wonderful veggie sandwich for me! It was on wonderful 7 grain bread with lettuce, tomato, red bell pepper, cucumbers, swiss cheese, cheddar cheese and mayo. So Good!! Of course you know, I did Not eat the chips! Those were Ralph’s! I had to be good because later…I was not so good. And since there is no photographic evidence ( I honestly forgot!) I guess it doesn’t count! So we’re looking forward to Saturday’s visit to the farmer’s market. I’m sure I’ll have get interesting photos there…that’s where all the hippies meet! This entry was posted in Uncategorized and tagged coffee, Enchanted Days. Bookmark the permalink. have fun at the market and then visiting with your friends, fran!! (of course, i do not know them but from what you say, i will place my bet that they will not stay over!!). i wish i could join you at java the hut, the market, and wear hippie gypsy bracelets! (i just bought a bunch of beaded bracelets and have been wearing them non-stop, they make me smile!). on vacation eating….there are no rules, and you are right, no photos means it doesn’t count, plus you have to make the most of your time and just have fun. the end! happy saturday! can’t wait to see more photos!! Cathy, you’re so sweet. I’m trying to post the night before to have them up early, but it’s hard to get myself organized here. The farm market was great but I couldn’t buy much because we’re leaving on Tuesday for California and I didn’t want too much left over in the fridge. Our friends cancelled so we were at liberty. Oh, I wish you could come to Java with us! It’s funny how you can just get lost regarding days while on vacation.Java the Hut looks so good, how nice to have a place like that in the neighborhood! Have a great time at the farmers market! I know the feeling. I rarely know what day it is! Hi Danni! I’m usually sure what day it is, but it’s so different since we’ve been in NM. Hope to get my head straight before we head back to NJ!! I’m envious of your java the hut/farmers’ market going lifestyle (and the sunrises and sunsets!). I have some jewelry that could use repair too, but I never get around to it! Hey, Zo! You’d love it here…it is so beautiful!